Yes, I will admit it. I got caught up in the "when will USC lose" talk. That is my job. However, Texas, Cal, Tennessee, and Notre Dame all overlooked their opponents last Saturday. It is hard to blame Texas. They played a good Nebraska team, whose only losses are to Southern Cal and now Texas this year. It was cold and snowy as the Horns overcame kicking woes and won the game 22-20. Cal did not overlook Washington, just under-estimated the Huskies' ability to pull the big upset. Tyrone Willingham has turned Washington football around, and they took Cal to overtime after a hail mary was caught for a touchdown as time expired, though they could not pull out the win. The Bears' Marshawn Lynch scored late in the 4th quarter to take the lead and again in overtime to give Cal a 31-24 lead. Tennessee and Alabama are fierce rivals, and I have learned my lesson in this rivalry: I will never pick this game to be a blowout or high-scoring ever again. It took a late touchdown run by halfback Arian Foster to get Tennessee the 16-13 win. Notre Dame, though, had the biggest scare of all. Their offense struggled all game against UCLA. Up one with around a minute left, UCLA punted the ball out of the end zone for a touchback. Notre Dame then ripped through UCLA's prevent defense, going 80 yards in three plays. 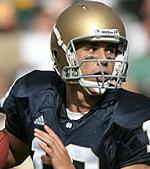 Brady Quinn then found wide receiver Jeff Samardzija in open space for a 45-yard game winning touchdown. These teams can worry about USC, West Virginia, and Louisville all they want. However, taking care of business should be goal number one for them. Let the chips fall where they may. Clemson - Running backs James Davis and C.J. Spiller combined for 386 all-purpose yards and four touchdowns in a 31-7 route over Georgia Tech. Clemson solidified itself as a top 10 team, but they need Boston College to lose if they want to get to the ACC title game. Colt Brennan - Hawaii is Texas Tech junior, and Colt Brennan is just another one of the great quarterbacks in UH history. He threw for 330 yards and 5 touchdowns as he lead the 5-2 Warriors to a win over New Mexico State. Hawaii is first in total offense in Division I and first in scoring offense in the WAC. Oklahoma - Life without running back Adrian Peterson started off well as Oklahoma beat Colorado 24-3. Allen Patrick rushed for a game high 110 yards and one touchdown. The defense forced four fumbles and had one interception as they dominated CU. Boston College - Even though Clemson had the most impressive win of the week, Boston College still has control of its destiny in the ACC. They beat last-place Florida State 24-19 last weekend in a huge game for both teams. They have four ACC games left - Wake Forest, Duke, Maryland, and Miami - and should be favored in all four games, though the ACC has been very unpredictable this year. Ameer Ismail - The Western Michigan linebacker tallied six sacks on Saturday, tying an NCAA record. Western Michigan had nine sacks total against Ball State in a 41-27 win. UCLA - I am not going to call UCLA a bad team, because they hung with Notre Dame and have lost to three quality opponents. Still, their prevent defense and conservative offense blew a chance to upset the Irish. A win would have been huge for UCLA football. Now they have to bounce back and qualify for a bowl game. Northwestern - The Wildcats are having a horrible year. Their only two wins have come against MAC teams who have a combined total of two victories between them. They led Michigan State 38-3 at home in the third quarter before giving up 38 unanswered points and lost on a last-second field goal. We now realize how much the late Randy Walker meant to this team. Oregon - Oregon had the potential to be a top 10 team this year. When they (luckily) beat Oklahoma, I thought this was their season to win the Pac-10. However, since that game, the Ducks have gone 2-2 with losses to Cal and most recently to Washington State. They can salvage their season by winning out and beating USC on the road on November 11th. Fresno State - FSU earned our respect after they almost upset USC in 2005, but the 2006 Bulldogs are losing respect with a dismal 1-6 record. Putting LSU, Washington, and Oregon on their out-of-conference schedule probably was not the best idea. The Bulldogs have lost six straight, after opening the season with a win over Nevada. Calvin Johnson and Garrett Wolfe - Calvin Johnson did not catch a pass in a game for the first time in his career against Clemson. Johnson will need a couple of big games if he wants to make the trip to New York for the Heisman ceremony. Northern Illinois' Garrett Wolfe, meanwhile, continued to struggle. He has gained just 70 yards rushing in his last two games, and his chance at the Heisman may have passed him by.